King Kylie is ready to take over the world. The almost-billionaire mogul signs one huge deal after another on a daily basis. And there’s nothing that turns fans more on than a collaboration by their favorite celebrity. If you are team Kylie, you’ll be more than happy to hear that the reality star is the new official Adidas ambassador. She is the third member of the family to join this venture, aside from older sister Kendall and brother-in-law Kanye. The youngest in the Kar/Jen clan took the amazing news to her social media to share it with the millions of fans. This was a somewhat expected partnership, considering that Kylie has been flaunting Adidas looks and sneakers for months now. Her sisters even shared the special packages with sneakers they received from the fashionista. At that time, there were no announcements that Ky might be joining the Adidas family, so all we could do was guess. Now that the news is official we can’t wait to see what they’ve prepared. “So excited to announce that I am officially an #adidas_Ambassador #createdwithadidas @adidasoriginals.”- said her post. The mega-popular sportswear label already confirmed that Jenner is the new face of their trending Falcon sneaker, which will soon come out in new shades. Following the biggest shoe trends for Fall 2018, Falcon is a chic chunky silhouette, which can upgrade all of your looks. 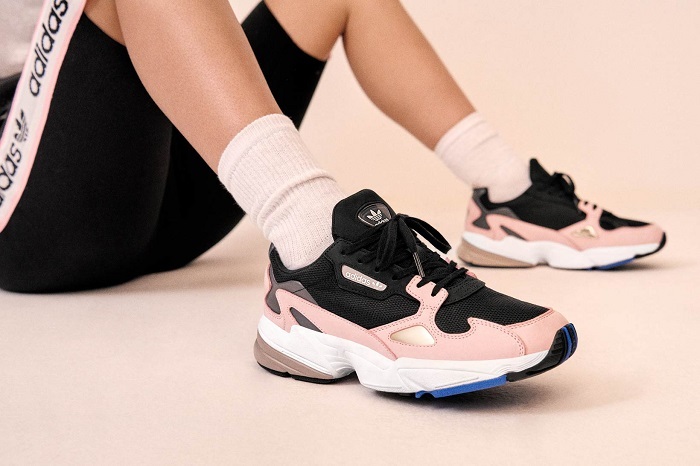 To celebrate the partnership, Adidas released their first campaign, which features the Falcon Dorf in a pretty baby pink shade with hints of black, grey and blue. “As a life-long fan of the brand, Kylie embodies the bold spirit of Falcon and we are pleased to announce her as the face of the campaign.”- the sportswear brand told Fashionista. Back in 2016, Kylie was announced as the ambassador of Puma. Right before that, the young Jenner starred in two of Kanye West’s collections for Adidas. The move sure caused a lot of controversies and was disapproved of by her brother-in-law. At that time, the rumor was that the makeup mogul scored a seven-figure deal with Puma to advertise their products. She fronted several of their campaigns and even created her own exclusive line. Now that she joined the Three Stripes club, we simply can’t wait to see her signature on new designs. Kendall, on the other hand, as an ambassador of Adidas Originals recently fronted the Arkyn and Danielle Cathari campaigns. This family sure knows how to stay busy.